…Top Ten Thailand Trips & Tootlings. When I realized it was time to look back through the previous year’s articles and decide on the best, I thought it might be a bit tough to find ten really good ones. I felt like I hadn’t done all that much compared with previous years, partly thanks to some really foul periods of bad weather, or maybe they were bad periods of foul weather, plus a period of general laziness that set-in mid-year. Well, I wasn’t all that lazy, just a bit tied-up with other things. But, I can see now, it wasn’t at all a bad year. The trips were a bit spread out, but some were so fascinating they generated four or five articles each. Any day trip that has that many things to write about, must have been good. A small island nestled at the top of Phang-Nga Bay, easily accessible via a forty-minute boat ride from a few places on the mainland. It’s cute. Mostly built on stilts out into the sea thanks to the scarcity of flat land, and with a now-famous floating soccer pitch. I had the impression the place is flooded with tourists after about 11am, so I recommend you go early. The place is small, and with a lot of tourists it would be hard to move around. That aside, I’d recommend you add it to your bucket list. Unique. A twenty minute slog up a steep gravel road, and an even more precarious and slippery journey back down are well worth it given the views from the top. 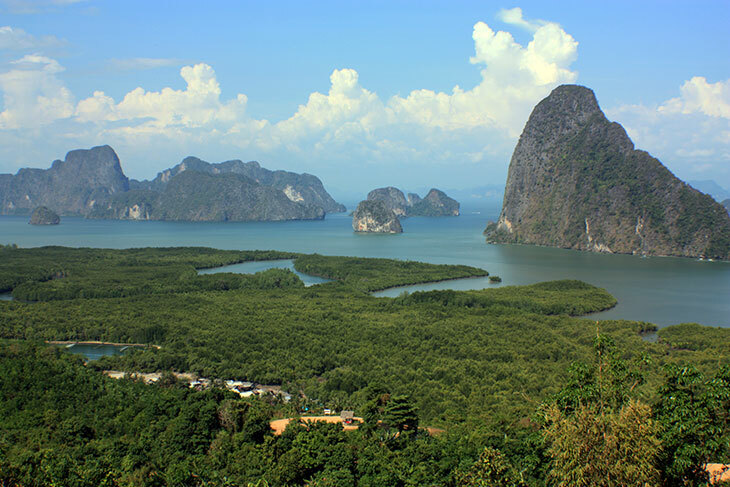 A 180° panorama of Phang Nga Bay awaits. You might need GPS to find the place as there are few signs, but trust me, even if you get lost a few times, the effort is worth it. Bring water, and a spare set of lungs. You’ll need them. Huai Nam Sai & Sal Forest Reservoirs. 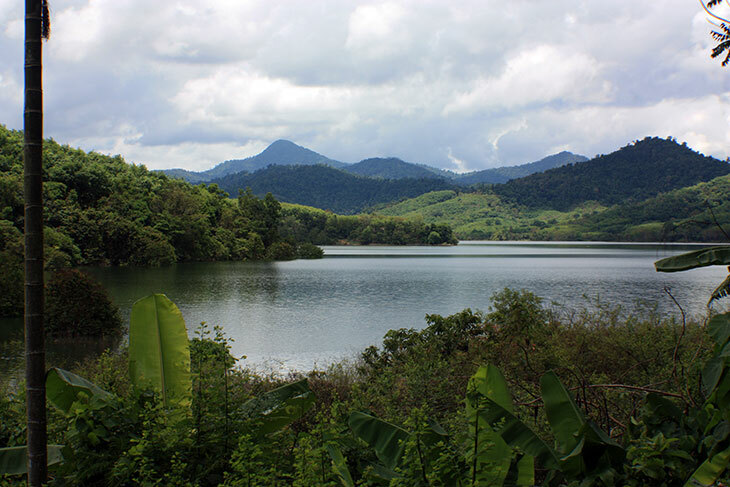 Close to the western border of Phatthalung Province, up in the hills, are two reservoirs. There’s not a lot to be said about two large bodies of water, except that the reflections and scenery are stunning. There are gravel roads running around the lakes so photo ops are many. That’s the whole story. Drive, click, click click, drive, click… You get the idea. 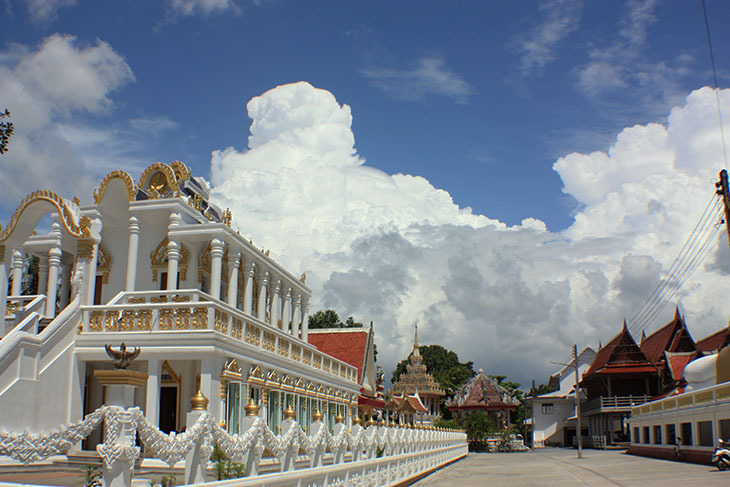 Many guide books/travel sites will tell you there’s not much to see in Krabi Town. In some ways it’s a fair comment, but the river views are nice, and both the interior and exterior of Wat Kaew Korawaram are exceptional. The white exterior and deep blue roof contrast nicely against a blue sky, and the interior murals are highly detailed. Well worth an hour or so of your time if you are in Krabi, and – like me – don’t want to believe the guide books. Large concrete-like slabs, that are made from 75 million year-old compressed and fossilized snail shells. They only exist in two other places in the world. 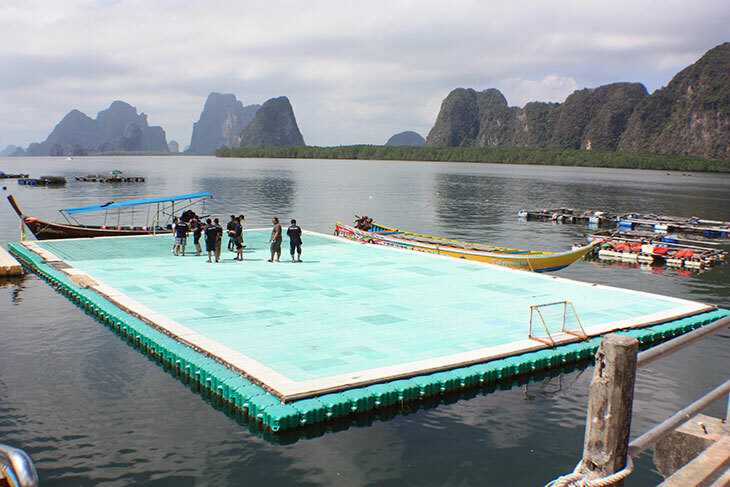 Definitely something different to do in Krabi Province. Tha Pom Klong Song Nam. 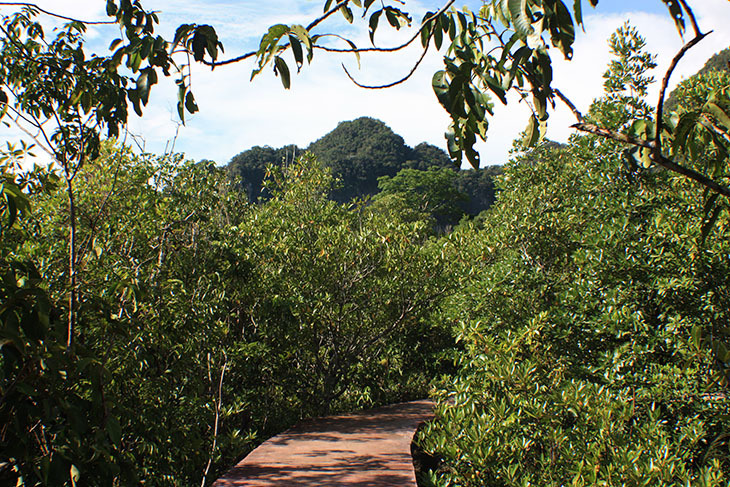 My sub-heading was “A Boardwalk Through The Mangroves” and that’s exactly what it is. 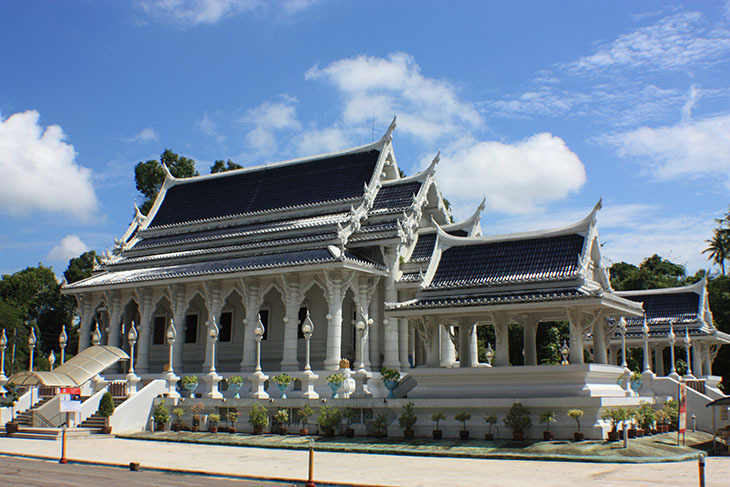 It’s hidden about 35kms north of Krabi Town, a few kilometers inland from the coast. It’s a pleasant and peaceful 30 minute walk, so long as you don’t exit at the other end, and then get hopelessly lost! What impressed me most was the construction. It was a lot of work just for me. Or so it seemed as there was a distinct lack of visitors. Not just one wat, but a whole host of buildings of various designs. The main feature is a reclining Buddha, so large that you can’t fit him in one photograph. The interior of the main building has some rather odd murals that must make sense to someone. At least they’re colorful. Despite the large number of tourist this area is well worth a visit. It probably needs about ninety minutes. I don’t visit many waterfalls even though Thailand probably has thousands. 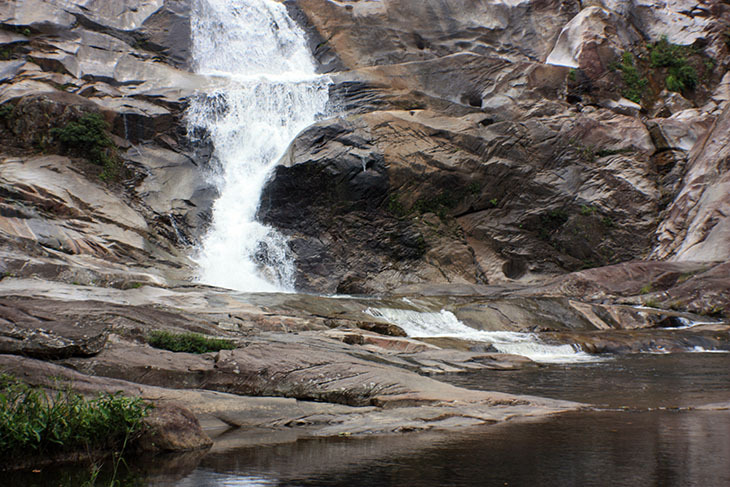 Often, they need a trip through the jungle just to see a trickle of water falling over some rocks … so, I don’t bother. But I did bother with Karom Waterfall, and I’m glad I did. 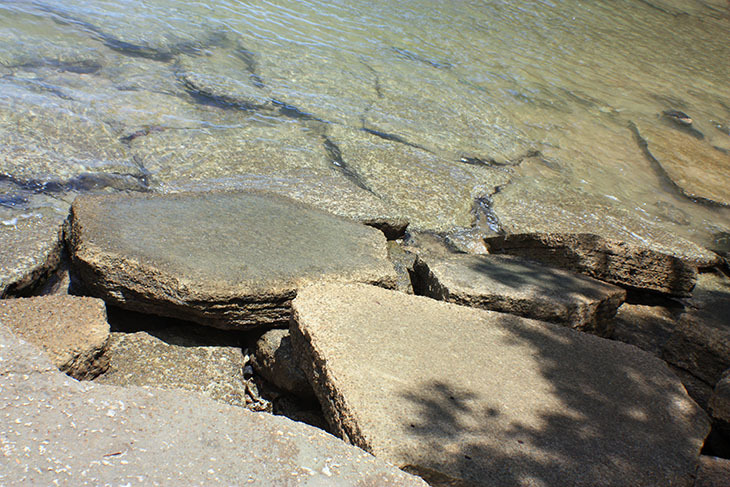 It’s no Niagara, but it has many levels, and the pathways are well laid and safe. Information boards along the way let you know about the foliage that borders the river. It needs a certain amount of effort to visit all levels as it’s quite steep uphill, but the trek is worth it. 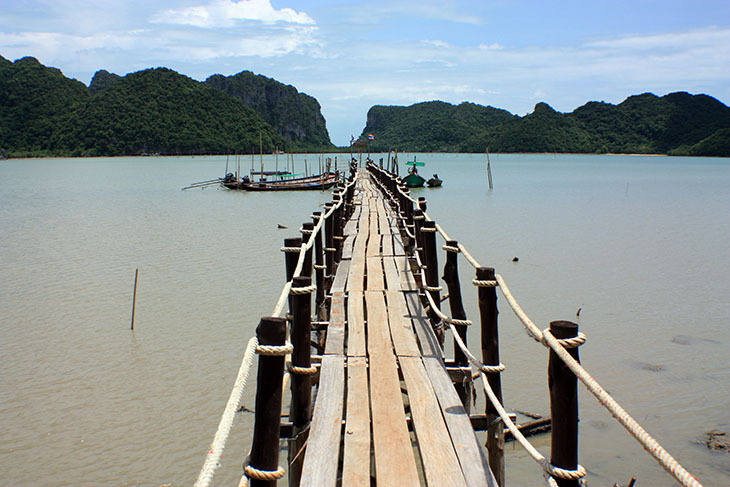 Ao Prao Jetty, Near Don Sak. Don’t get too excited. It’s just a simple jetty. Not worth a day trip. But, if you are tootling around the coast line north of Khanom and towards Don Sak, it’s worth a detour. It’s picturesque. A good photo opportunity. See the simple life of Thai fishing persons. It sounds a little irreverent to say that attending a ceremony marking the King’s cremation was a “highlight” of my year. But it was a privilege, and not something I will forget. I joined a few other Good People of Khanom in paying last respects at the main wat near the center of town. ’nuff said.